Montana has launched Montana Initial, a new fragrance for men. Montana Initial invites the man to explore his origins. It is an initiatory voyage through the fascinating cradle of mankind, holding secrets of human nature. As an adventurer, he walks in the footsteps of his ancestors. He unearths hidden treasures for million of years. Such a globe trotter, he lives harmoniously among the tribes, inspired by their culture, their rituals. He discovers the benefits of plants, the magic of spices and draws on their knowledge to develop his aromatic grimoire. Then, he composes his own magical elixir with stimulant, euphoric and soothing virtues to find that serenity and peace of mind, as a warrior before battle. He combines notes of bergamot, cinnamon, nutmeg and cardamom and decides to refine his formula with the lucky charm of the tribe he met: tonka bean. He ends his potion with relaxing and woody notes of white cedar. Montana Initial, a return to origins. 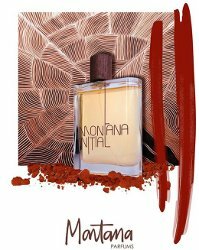 Montana Initial is available in 75 ml Eau de Toilette. Wow! There hasn’t been a Montana launched is ages! I’ll have to look this one up. Yes…was wondering if they’d switched licensees or something. Will sniffing this perfume get me as high as the person who wrote the ad copy? But seriously, I like the list of notes — sounds sweet and spicy.